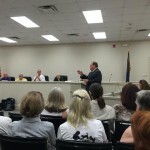 July, 14, 2015 – Civility, with pleas marked by facts and figures, characterized the meeting between two factions – Piedmont Tech Foundation Board, backed by Piedmont Technical College President Brooks and his entourage, and the new Edgefield Preservation Association, led by Max Shanks and a community of passionate individuals. Here were two groups, seemingly on parallel courses, with possibly no way to meet at any juncture. These two groups, populated by a PTC contingency and a second contingency of preservation enthusiasts – but preservation with the intent to bring back a slack economy – also seemed to own some of the same goals for Edgefield through differing routes. 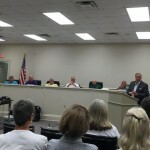 These two groups were heard by a full Edgefield Town Council at the County Council Chambers on Monday evening, July 13. As background, there is a warehouse on the PTC campus in Edgefield that is old (1919) and historic (cotton warehouse when “cotton was king”). 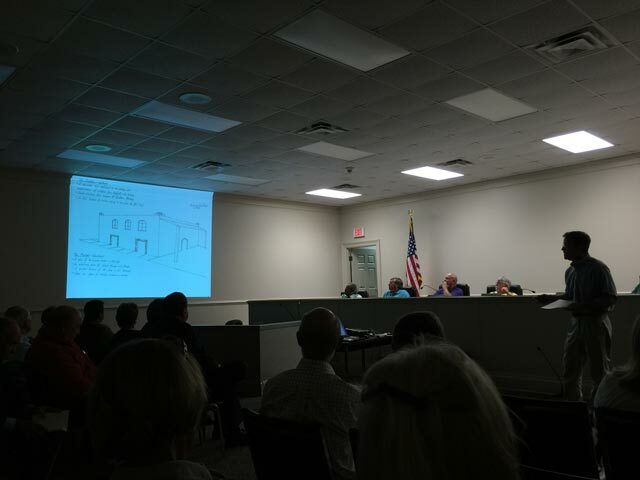 A group, now calling themselves the Edgefield Preservationists Association, heard that Piedmont Tech may be demolishing the building “for a parking lot” (completely denied by Dr. Brooks, PTC president). These preservationists want to save the building for historic and economic reasons, hoping to gain ownership and turn it into a “world class art museum (pottery)” and a place for the Farmer’s Market. 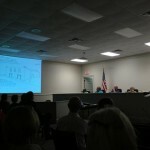 PTC made a presentation showing the building as not in good shape and actually needing to be demolished, according to their belief (photos of brittle mud brick, a falling roof in one area and few sturdy supports left.) One does know that almost any building can be reclaimed with enough money, however. PTC pointed out that the other buildings on the campus were new buildings built within the walls of the old warehouses. 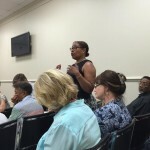 Their plan has been to put a fence around it, and then, after a meeting in the future of their commissioners to determine what needs PTC in Edgefield may have, at that time to take action. It then may be demolished to build new classroom space. According to their representatives, PTC has no other room for growth. 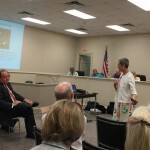 In this presentation they made no bones about it – they cannot give the building up by sale or gift. The preservationists presented a wonderful plan for creating a museum and rooms for special events, a draw for the 25,000 visitors expected through the NWTF conferences, in one year. Their understanding is, from an engineer who did not do a detailed study, but rather a kind of “walk through,” that the building can be saved. They contacted many important museums in the surround that responded with eagerness to help with this project. And, they iterated numerous possibilities for attaining the funds necessary. After the two presentations that took almost two hours (to an attentive and receptive audience, for sure) it seemed that PTC had shorn up, even more, their reasons for not granting the building for others’ use: that they can neither sell nor donate due to the policies in place in their ownership of the building, through their Foundation Board. Preservationists, with this knowledge, lost any hope of claiming the territory except in the possibility of there being a way to work together to save the building through restoration. Two members of the preservationist group made a plea for either sharing the building (which a clear “no” was heard) at some future date or working together to save it and make it work for either group – the College or the Town. No response to that plea was that closing the door or giving time for thought. What is real and exciting is that the Edgefield Preservation Association (now under auspices of the ECDA, a non profit group) has been formed and wants to help hold onto buildings that should not be destroyed and to find use for space that can be of economic benefit to the Town and area. And the group is made up of creative, passionate citizens. The story of Lake City, SC, now having a ten-day art event that brings 20,000 people each year and has turned their economy around, gave excitement to the prospects for Edgefield and the surround, moving forward, if the PTC building can never be claimed.